Webmasters and bloggers usually need at least basic image editing skills to work with images that they post on their websites. These image editors need to provide access to a basic set of features that include resizing images, highlighting parts of them, copying part of the image and saving the images in various image formats. Advanced image editing options that include working with layers, maskings, macros and the like are usually not needed. 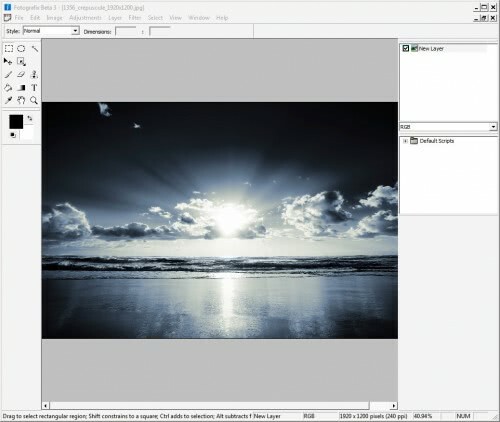 Enter Fotografix, a lightweight portable image editor, that might be suited for the needs of webmasters and bloggers who want a simple image editor that supports all the features that they need. While Fotografix does not come with the functionality of Adobe Photoshop or GIMP it does offer access to all those features that most webmasters and bloggers require, and then some. The image editor opens images as fast, if not a tad faster, than the popular Paint .net image editor. Webmasters have fast access to the image edition features that they require the most and it usually takes only a few seconds to edit an image so that it can be posted on a website. The only feature that seems to be missing is the ability to quickly draw a rectangle or circle around a part of the image to highlight that part. Fotografix is an impressive (for that size) image editor that fits perfectly in every tools collection. It is compatible with computer systems running Windows XP and above. Tried and don’t like it. I am exactly blogger with Paint.NET and it has awesome features for screenshot manipulation. For example if I create new canvas in Paint.NET it checks clipboard for image and auto-fills dimensions from it. Nothing like that in Fotographix. :( Otherwise it is interesting software (scripting) and still beta – it would take more polishing to be good image editor option. Can anyone tell me how to take an image and multiply many times so you get an Andy Warhol effect in one photo image, on fotografix?